Botanical Name:: Lycopus europaeus, Lycopus virginicus. 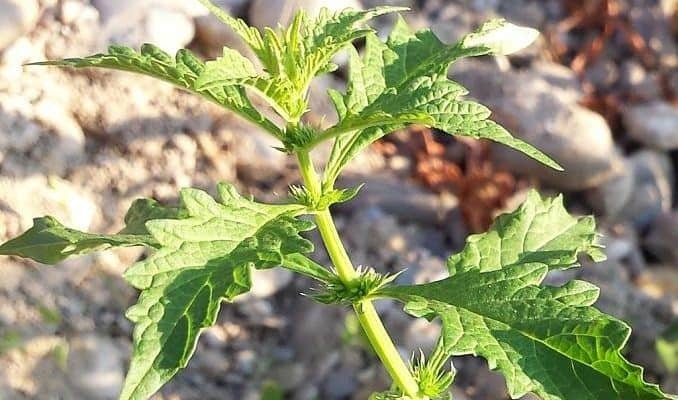 Other Common Names: Gypsywort, gipsywort, water horehound, ou di sun, lycopus europaeus, lycopus virginicus, egyptian’s herb, famsyon maiy, menta de lobo, sicklewort, middle comfrey, water bugle. Habitat: Bugleweed is a rhizomatous herb endemic to Europe and Asia, and introduced in the United States. In the wild, it proliferates in marshlands and wetlands. Plant Description: Bugleweed is a perennial plant belonging to the mint family and is closely related to a European herb known as gypsywort (Lycopus europaeus). The two herbs are so closely related they are often used interchangeably as medicinal herbal treatments. Bugleweed can grow up to 2 feet in height. It blooms during the months of June, July, August, and September, and bears fruit from August to October. The elongated leaves are purple in color initially and then turn green as they unfold. The flowers are small and white in color with purple spots, hermaphrodite and can self-fertilize. Bugleweed can grow on all soil types (sandy, loamy and clay) at varying soil pH levels. It needs a moist environment to develop and can grow profusely in flooded soil. Plant Parts Used: The above-ground parts (leaves and flowers) are harvested for medicinal purposes. Traditionally, this herb has been used to cure coughs and respiratory disorders. It is also thought of as a natural remedy for sleeplessness. Bugleweed is a natural source of phytochemical compounds, including various tannins, lithospermic acid, lycopene, flavonoid glycosides, phenolic derivatives such as caffeic acid, chlorogenic acid, ellagic and rosmarinic acid, essential oil, magnesium; and resin. Bugleweed’s medicinal properties are said to be due to the presence of lithospermic acid, as well as the other organic acids in the plant’s extract. American bugleweed (Lycopus virginicus) and its European counterpart gypsywort (Lycopus europaeus) were widely used in folk medicine for treating anxiety, tuberculosis and heart palpitations. 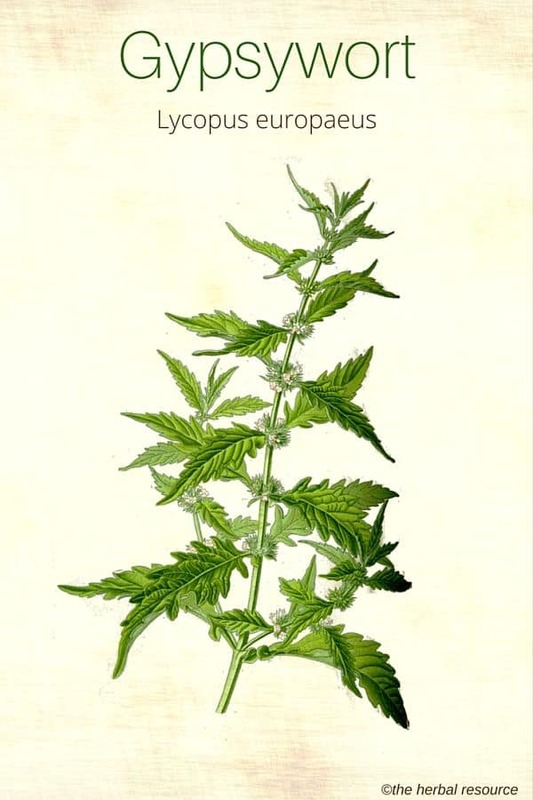 Bugleweed was also utilized by gypsies of old as a cosmetic as this herb is a major component for manufacturing black dye, hence the common name “gypsywort”. Extracts from this herb are thought to aid in normalizing heart rate, which is indicative of its potential as an alternative treatment for a tachycardia. The herb is commonly used as a natural treatment for some symptoms of Grave’s disease, such as palpitations and convulsions. The herbal activity is sufficient for mild cases of the disease and is considered safe for long-term administration. It is traditionally used to stop iodine conversion in the thyroid gland and can be used as a natural treatment for hyperthyroidism and related diseases. The leaves may also be used as a natural cure for wounds and abrasions. As a commercial supplement, the common dose is two capsules of bugleweed administered twice daily with water (during meal time) but the manufacturer’s instructions should always be followed. Alternatively, 1–2 grams of the whole herb can be administered thrice per day as a tonic, but the dosage must be limited to 1–2 ml. 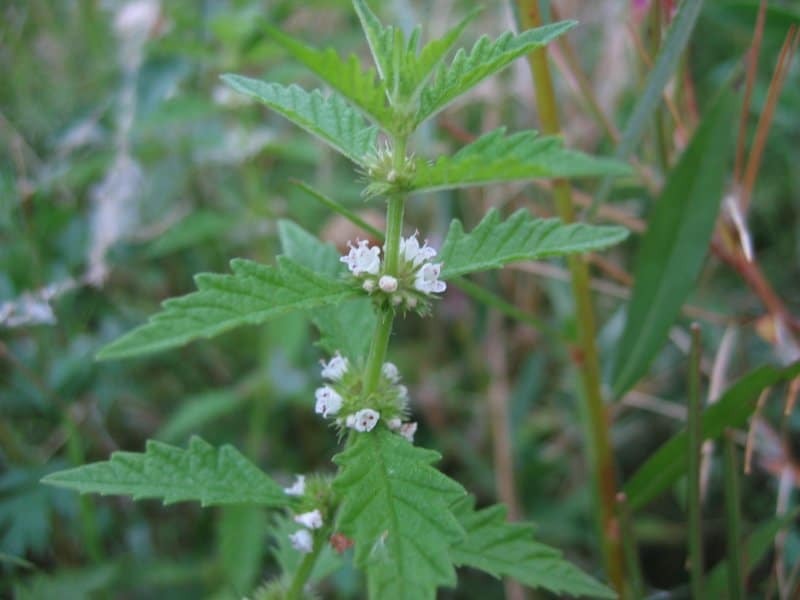 Use of bugleweed is contraindicated for pregnant women and women who are nursing. People suffering from hypothyroid diseases should consult a healthcare provider before using bugleweed. Because bugleweed may interfere with blood glucose medication, it is contraindicated in patients with diabetes or hypoglycemia. People with endocrine disorders such as hypopituitarism, pituitary adenoma or hypogonadism should not take it. Bugleweed should never be substituted for prescription thyroid medications except on the recommendation of a doctor. Patients who suffer from osteoporosis or who are taking oral contraceptives or fertility drugs should consult their doctor before taking the herb. Bugleweed has only been tested in thyroid conditions involving overactive thyroid. There have been no clinical studies performed on humans. The information on the effects of it was derived from animal studies. The effects of medication on animals may be different from the effect on humans. Researchers have not yet evaluated the inhibiting effects of it on hormones.